"Gilding the Greyhound" is the brainstorm of Susan, whose dream is to produce high-end dog garments, mainly for hard-to-fit greyhounds, whippets and Italian Greyhounds. Their natural elegance and quiet demeanor win them admirers wherever they go. In truth, our beautiful coats really are "gilding the greyhound". A portion of our profits is used to support the rescue of these gentle creatures, and to combat animal abuse. 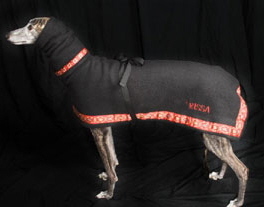 We make sturdy yet glamourous dogcoats, mainly for greyhounds, Iggies and whippets. Our winter coats keep hounds warm, our raincoats keep them dry, and our suncoats protect their sensitive skin from UVA and UVB rays. We also make co-ordinating snoods for the coats, and adorable hats - some with a little "bling" just for fun. If you like our coats but have a different breed of dog, contact us. We can custom fit a coat to fit your dog. Stock coats can be returned (in good condition) for a full refund; custom coats will require an adjustment and a partial refund. 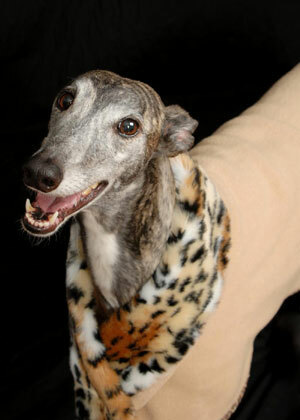 Our dog coat business began when Susan fostered a greyhound who arrived with an ugly ill-fitting coat. "Why, I could do better than that!" led to a trip to the local fabric store and ultimately Gilding the Greyhound. Our team can sew and tailor, so the the resulting coat was custom-fit, and then trimmed to make it elegant. We were so pleased with it that we made a coat for her own greyhound (super-model 'Rissa - pictured throughout this site.) When we took the "glamour girls" to the next Greyhound Meet & Greet, fellow greyhound owners wanted to buy the coats off their backs. That's when we knew that we were on to something.